Review posted October 6, 2015. Chronicle Books, San Francisco, 2015. 48 pages. 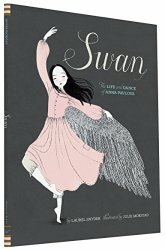 This is an evocative, poetic, and beautiful picture book biography of the great ballerina, Anna Pavlova. The actual text is short on details and long on atmosphere, but it gets the story across. A well-written, still mellifluous Author’s Note at the back fills things in. It was a hard life, and Russia under the czars was generally a world where the poor stayed poor. Anna’s life should have been dismal. But one night Anna’s mother told her, “You are going to enter fairyland,” as the two climbed into their sleigh and sped off to the Mariinsky Theatre. There, Anna heard Tchaikovsky’s music for the first time. She watched the dancers step out onto the stage, and her life was changed forever. Anna knew what she wanted to do with her life. The main picture book text begins with this incident of Anna and her mother going through the snow to the ballet. Julie Morstad’s illustrations are perfect for this book, capturing the beauty of Anna’s grace as a little girl in a plain dress all the way through her triumphant performances as The Dying Swan. Until one night she takes the stage . . .
and the lamps shine brighter. see her face, her flutter? Anna was born for this. I didn’t know before reading this book that Anna Pavlova worked to bring ballet to everyone, where before it had been primarily an art form enjoyed by the rich. But ballet changed Anna’s life, and she wanted to bring its power to others and traveled around the world doing that.